What is Executive Functioning and How does it affect my child? Executive Functioning (EF) is a term often used in conversation when speaking about Autism Spectrum Disorder. According to Wikipedia (not the fanciest of sources:)), “Executive functions is an umbrella term for cognitive processes that regulate, control, and manage other cognitive processes, such as planning, working memory, attention, problem solving, verbal reasoning, inhibition, mental flexibility, task switching, and initiation and monitoring of actions”. I refer to executive functioning deficits often when speaking to parents about why they need to prepare there children in the morning for the day ahead (visual schedules, verbal walk through of the day). Elizabeth Pellicano and colleagues. In this article, the researchers discuss the impact that EF has on a multitude of routine functions of daily life. A 9 year old boy has been out of school for almost two years as a result of severe social anxiety and medical related issues. In this time, he has recieved home school instruction from his mother. The time has now come for him to return to school and benefit from a more comprehensive academic and social learning experience. This boy has Asperger’s Disorder. How do we make this experience more predictable for him (keep him from catastrophizing all of the unknowns)? 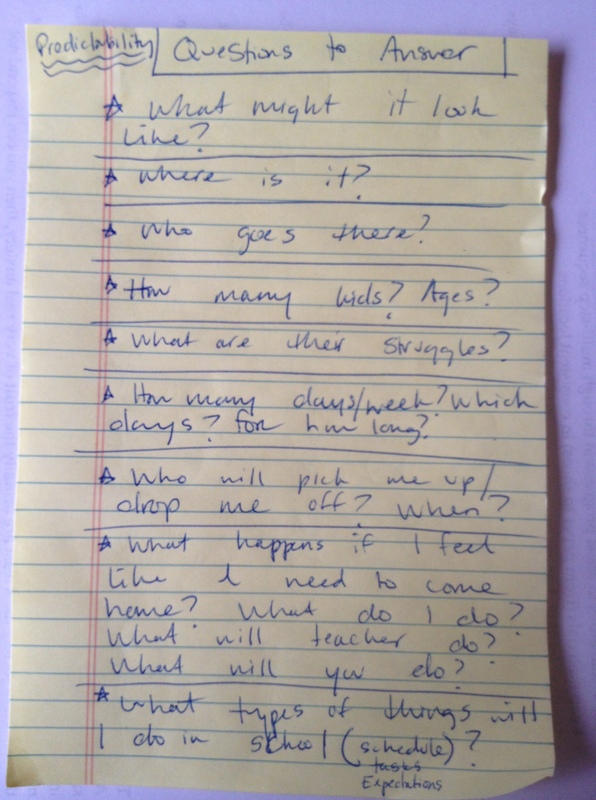 First, we make a list of questions that need to be answered by us (the parent or practitioner). Gradual exposure to the school’s environment (on a weekend), cartooning/ visual storybaording about worst case scenarios, role play, and other interventions can all come after this initial list of questions. I was sent this great article about anxiety and Asperger’s from one of my wonderful parents last week and was blown away by the insights inside. The article provides a unique look into how anxiety is felt by the individual with Asperger’s while also giving parents and practitioners a new way of addressing challenging behaviors that this author attributes almost exclusively to anxiety. Aside from being a person with Asperger’s herself, the author is also a mother of children with ASD. I’ve provided a short excerpt from the article below but you really must read the full article to see its true worth. Excerpt from the Article written by Jennifer O’Toole, author of “Asperkids”.